Chocolate Cupcakes + Toblerone = Chocolate Tobbies. This has been a hot favourite amongst my friends and relatives. Moist & Rich Chocolate Cupcakes with a Toblerone Centre, Chocolate coated and sprinkled with Chocolate Pearls and White Chocolate Chips... You have to try it for yourself. 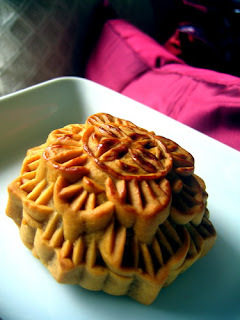 Mid-Autumn Festival is round the corner... This year, it is on the 25th Sept 2007. What better way to blog an entry for Singapore's National Day this year? National Day Muffins!!!! By coating my blueberry muffins with white chocolate and placing an edible Singapore Flag on each of the muffins. Happy Birthday, Singapore!